The exhibit “if all you have is a hammer, everything looks like a nail” is currently on display at the Chicago Cultural Center through May 10, 2015. The installation consists of four works; two sculptural, one photographic and one video by Alison Ruttan, an Illinois-based artist whose research-based approach has led her to depict the destructive, violent and savage aspects of a humanity operating within a war-torn world. In A Bad Idea Is Good Again (2010 -ongoing), Ruttan has constructed nearly twenty high-rise buildings, miniature in scale and size, in various states of ruin to demonstrate the process of decay that ensues when a city is caught in the crossfire of war. The collection of buildings sits like a ghost town, effectively producing feelings of uncanny to the onlooker aware of the fate of its missing inhabitants. 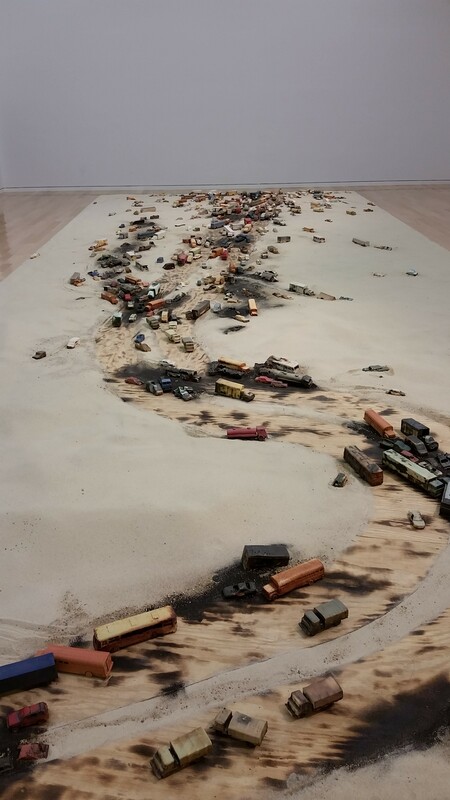 Similarly, Ruttan’s Line in the Sand (2015) displays nearly five hundred abandoned and destroyed miniature cars in a procession line, the scene recalling the 1991 event in which the Iraqi military attempting to retreat from Kuwait were attacked by American and Canadian forces. Even in times of surrender, wartime strategies prove to be unrelenting in their sacrifice of human life. In The Four Year War at Gombe (2009-2011), human actors, wrought with blood and bruises, stage several murderous acts within the photos, further illustrating the capacity humans possess for inflicting violence during times of war. Ruttan presents a cohesive body of work, infusing fresh perspective onto a rather exhausted theme. Viewers are prompted to consider the damaging aftermath of war by considering the physical structures that remain wasting in its path. Paul Makris, the culmination of Spencer Stucky’s 2015 BOLT Residency, occupies dual sites, the Chicago Artist’s Coalition and Front Room in Wicker Park. The exhibition guide at the entrance of the gallery at CAC is the key necessary to fully enter the exhibition. Replacing wall text, Stucky provides an index of the objects on display, complete with titles, measurements, dates, and origins. 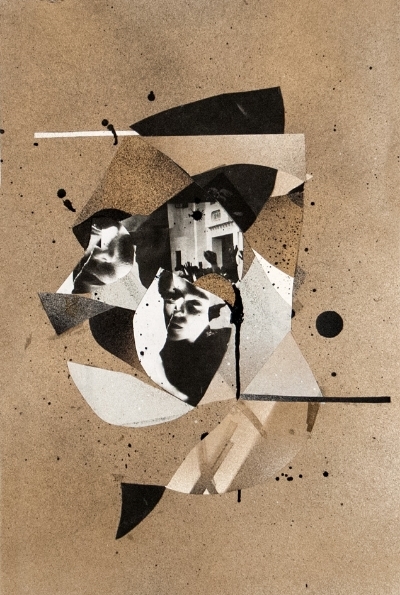 None of the objects were manufactured by Stucky, save for a photograph of a photograph which intentionally reveals itself as a degraded copy. The guide also contains an integral essay by Karsten Lund, which is elucidating and at the same time mystifying, as he poetically provides insight into the significance of the objects on display and delineates the underlying theme of constructed narratives and their residual magnitude. The aesthetic cohesiveness of the exhibition, intriguing in its range of objects (painted reproductions of photographs of sites of myths, neat stacks of recycled newspapers from the Chicago Tribune interrupted by alien-looking instruments used for squid fishing, porcelain interpretations of alligator backs, a 1982 Sanyo radio tuned to the same static station as the 2012 Panasonic in Front Room) is deepened once one familiarizes herself with the printed information. The multitude of connections between them are dense in the way a heavy fog is both tangible and not. Enchanting in its opacity, to avoid the conceptual rigor that Paul Makris demands is to deny oneself the potential for accessing the inaccessible, whether real or imagined. The works in Mirrored Infinity explore ideas of reflection, transformation and personal discovery. Drawing inspiration from Jorge Luis Borges’s short story, The Approach to Al-Mu’tasim, John Whitlock constructs broken narratives that reflect points of thought around existential and spiritual uncertainties. Whitlock creates small black and white collages that are then scanned, and repurposed into larger mixed media compositions, stretching the boundaries of their original framework. Simple, familiar shapes are combined to create quasi-religious iconography; Gold is introduced as both a symbol of preciousness and an implication of age. For his video installations, Whitlock has run a video feed into an infinite feedback loop that he animates with simple camera movements, creating self-reflexive geometric distortions. The pulsing circular patterns and reflective mirror fragments manifest real-time, infinite transformation. As the illusory literary critic in The Approach to Al-Mu’tasim might put it, Mirrored Infinity is a “detective story with a mystic undercurrent.” It’s about finding yourself in the search for another. Perceived Realities, the MFA Thesis show at Columbia College, brings together the wide-ranging work of Columbia’s MFA photography students: Phaedra Call, Ilana Cheyfitz, Allison Clarke, Juan Giraldo, Yeinier Gonzalez, Elaine Catherine Miller, and Orlenajean Vieira. With only seven artists occupying this roomy gallery, the work has room to breathe and is installed seamlessly in the space, except for a sonic dissonance problem where a few of the pieces with sound conflict with each other (an issue for many gallery spaces, usually unavoidable). Amongst the expected photographic fare (large-format photographs, videos, collages and artists books), Elaine Catherine Miller’s installation Waiting (for the Sun to Set), 2015 stands apart. Miller’s piece is an room within a room; a corner space built out to mimic the sterile floors, walls, and furniture of a government office or a doctor’s waiting area. A faceless female mannequin in a conservative woman’s suit sits, legs crossed, in a chair, holding an apple, while a generic sunset video plays in a loop on a monitor. The palette of light pink, dark pink, black and gray, along with the fake sunset and an artificial potted palm gives the work, at its surface, a tumblr-esque aesthetic, but at a deeper level the installation calls to mind the worst moments of waiting in our lives, perhaps for results of a medical test, or for a loved one to come out of surgery. The video plays on and on, even when no one is around to watch, projecting a false calm with an undercurrent of desperation. The Stolbun Collection launched it’s Summer Exhibition Series 2015 with current MFA grad, Hyegyeong “G” Choi last week. The Stolbun Collection exists in an apartment building overlooking the Chicago River, with views of the Lake Michigan, and surround architectural gems. Choi’s work was installed in the bedroom and one piece in the bathroom of the apartment. Choi’s work expresses her turbulent past sexual experiences and current relationships to men through her paintings. She uses bright colors, sculptural elements, and various paint mediums to confront the viewer with her content. By having the work in the pristine apartment environment, Choi’s work came to the fore. 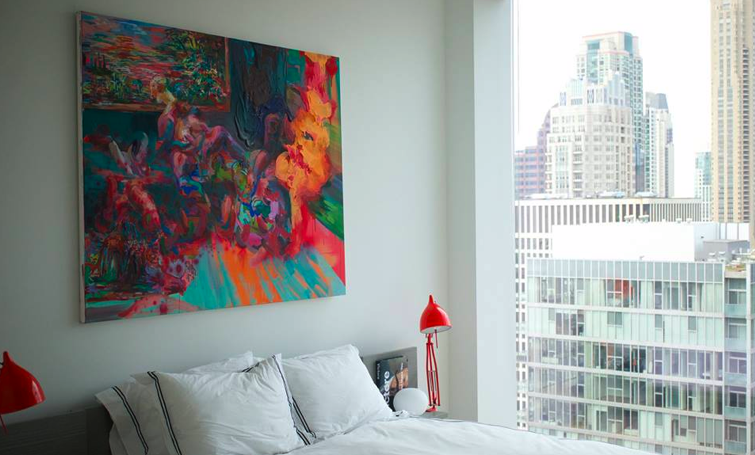 With the natural light pouring into the bedroom, the viewer is able to see the nuanced, painterly strategies that Choi employs, where she might perhaps sneak in a secret glossy phallic form that can only be seen in proper lighting. With Choi’s work specifically, the space is not just a bedroom exhibiting the work, it acts as an entire installation where one can consider the bed as an object in relation to the paintings. We can then ask whose room is this? Who wakes up to these paintings? Is this the bed where the activity in these paintings take place? Probably not, but it is fun to think as such. 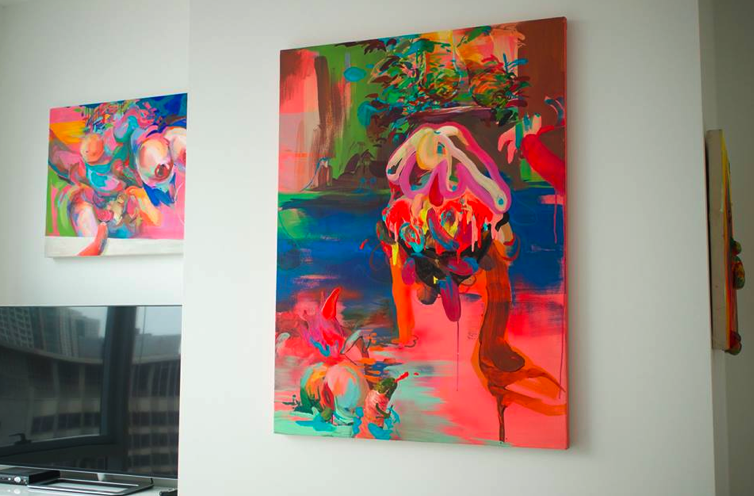 Choi has often expressed that her paintings explore ideas about sexual desire and how she can subvert and pervert these desires. In this show, I enjoy pondering over the person who “owns” these paintings and perhaps lives his or her desires vicariously through Choi’s painted perversions. Please join Matthew Rachman Gallery for the opening of Traverse, an exhibition of new works by artist Linc Thelen. Meet the artist during the opening reception and hear first hand about the process, inspiration and evolution of Traverse. Linc Thelen’s new series is a study of lines and their intersections. By incorporating the fundamental use of light, texture and color he creates spontaneous emotion, which reflects the fluidity of life. The work represents real life metaphors relating to human relationships and the evolution of time. Painting for over two decades, Linc Thelen’s style fuses classical training with a modern perspective. Thelen’s works consist of abstract paintings described as dream-like and esoteric layered with calming emotion – an attempt to deconstruct the form. Thelen received his BFA in painting from Northern Illinois University. Please visitwww.lincthelenart.com for more information. Matthew Rachman Gallery features a carefully curated collection of Mid-Century Modern furniture and contemporary art. Exhibitions are held regularly and their collection of rare vintage finds and curiosities changes constantly. The gallery is also available for event rental for philanthropic and private functions. For more information please visit http://www.matthewrachman.com. Intuit’s annual Closet Clearance Sale featuring new and gently used women’s clothing, shoes, jewelry, hats, scarves, purses, and accessories donated from some of Chicago’s best closets. OPEN CALL: Pot Luck Salon seeks discarded art! Since 2009, the Salvage Art Institute in New York has functioned as a gallery for art considered too physically damaged to circulate in the market. These no-longer-artworks, which have officially lost all value, are currently on view in Chicago. In response, Pot Luck Salon, a collective engaged with the spoken word and live action, will salvage art discarded by its creators. Pot Luck Salon already has two such works in its collection, one rescued through SAIC’s Craigslist page. Do you have some works you’d rather throw in the trash? Mount them on our walls in a day-long exhibit dedicated to failure and loss at Above the Picture Framing Shop. To participate, write to potlucksalon@gmail.com. Image: Hayan Song, Pigeons, 2015. OUR KICK-OFF TO THE OUTDOOR SEASON OVER #MEMORIALDAYWEEKEND (indoors too!) May through Sept! 300 vendors with the best treasures, Live bands outside each day, A DJ Shade Shack, a MillerCoors Beer Garden, Indoor air-conditioned building, kids activities, local eateries, drinks and the best people watching! -KIDS 12 & UNDER FREE!! The newest Architecture and Design exhibition at the Art Institute of Chicago opened on April 11, 2015 with an unconventional, round table ‘salon’ in the middle of the second gallery. The exhibit focuses on five up and coming experimental architects who are challenging the criteria of the existing architectural canon. These young architects: Bureau Spectacular, Erin Besler, Fake Industries Architectural Agonism, Formlessfinder and John Szot Studio are what the wall-text in the exhibit refer to as digital natives with an enhanced knowledge of architectural history. Both of these qualities are utilized over a range of formats and presentations to convey the new direction these contemporary architects are taking this traditional medium. The exhibition focuses on the ways in which these five architects are interpreting the use of digital technology while negotiating their place in the past and future of architecture. From Fake Industries Architectural Agonism’s Video Rooms: No Vacancy (2014), a video of baby chickens wandering around an architectural model, to Bureau Spectacular’s Cave Painting VIII/ White Noise from Another Past, a hysterical interpretation of Hieronymus Bosch’s famous triptych using architecture instead of crazy monsters and humans, the exhibit is a conglomeration of every medium you can think of. How exactly do Twitter and Instagram affect discussions around architecture? This question, among others, is explored in the second gallery where many aesthetically pleasing conversation starters are located. Organized by Chicago’s own publication Mas Context, the events in coordination with the exhibition take place here at a large round table. Far from being a conventional exhibit, Chatter contrasts strikingly with the museum in which it is located. This exhibit, like many coming from the Architecture and Design Department at the Art Institute of Chicago push the boundaries of exhibiting in a traditional museum setting.